Opening in September 2010, prior to the start of the International Food & Wine Festival, will be a new addition to Epcot's list of great places to dine. 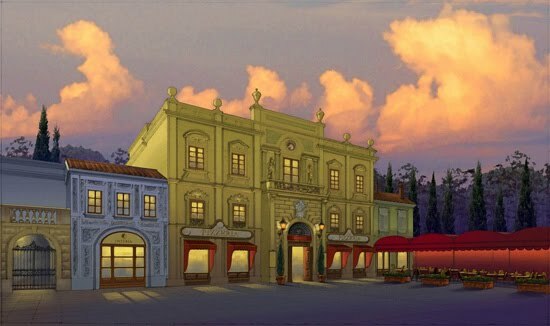 The new 14,000 sqft restaurant will be called Via Napoli, providing an authentic Italian Pizzeria in the Italy Pavilion of Epcot's World Showcase. It will be located next door to the Tutto Italia Restaurant. The Patina Restaurant Group which currently operates Tutto Italia will also operate Via Napoli. The above picture shows the construction under way for Via Napoli earlier this Spring in anticipation of a September opening. Notice Tutto Italia on the left hand side. Via Napoli will take up the entire rear wall area and expand the boundary of the Italy Pavilion. This is a totally new building being created for this restaurant. The Patina Restaurant Group prides itself on its other authentic Neapolitan Style Pizzerias including Naples 45 in New York City, and Naples Ristorante E in Downtown Disney - Disneyland in California. Patina Restaurant Group CEO Nick Valenti created the concept based upon his travels in Italy and studying at famous Naples Pizzerias: Da Michele and Trianon. In order to create authentic Neapolitan pizzas as they have successfully done in their other locations, there is great care in using authentic ingrediants such as San Marzano tomatoes, Caputo flour, handmade fresh mozzarella, Parma Cotto, crumbled sausage and water calibrated specifically to the pH found in Naples. A unique feature at Via Napoli will be the wood-burning ovens, which are named after the three active volcanoes in Italy – Mount Etna, Mount Vesuvius and Stromboli. Each oven will be sculpted with the “face of the volcano” -- reflecting the gods whose mythology surrounds each volcano’s history. These unique ovens will make Via Napoli another great Disney World Restaurant that has great theming and details that go well beyond the food itself. This September, Patina Restaurant Group plans to open a new casual pizzeria, called Via Napoli, adjacent to Tutto Italia Ristorante, its restaurant in the Italy pavilion in Epcot® World Showcase at Walt Disney World® Resort in Lake Buena Vista, Fla. While in Naples, Valenti spent time studying the art of dough, crust, sauce and oven temperatures at the famous pizzerias Da Michele and Trianon. At Da Ettore, he discovered the art of pagnotiello, a folded round of pizza dough filled with mozzarella, ham and mushrooms. The new 14,000 sq. ft. pizzeria will feature a selection of classical Neapolitan pizzas, ranging from pizza bianca, quattro stagioni, piccante, ortolano and a traditional margherita. Famed Pizzaiolo Charlie Restivo will serve as executive chef at Via Napoli, where he will craft the pies using simple and delicious Italian ingredients such as San Marzano tomatoes, Caputo flour, handmade fresh mozzarella, Parma Cotto, crumbled sausage and water calibrated specifically to the pH found in Naples. Judging by the discussions on the internet, Via Napoli is a much anticipated addition to Epcot. There are still many details to be revealed such as the complete menu, food pricing, and whether or not Via Napoli will participate on the Disney Dining Plan. Hopefully all of these questions and more will be answered shortly, as we count down until the September opening. 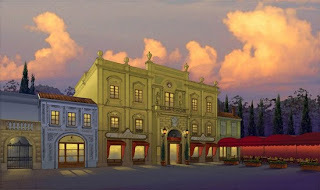 0 comments to "Via Napoli Brings Authentic Pizzeria To Epcot Starting September 2010"